Tu es belle | Boostew! Today two elegant teenagers stopped me to say “madame, vous etes tres elegante!” and sniggered. I could think of nothing to say. I feel very scruffy here. Walking to the museum the whole north side of the island is flooded. 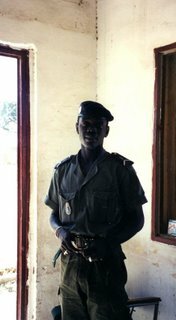 I was stopped by a gendarme – Mamadou – who demands ‘when are you coming to see me?’ He turns out to be quite nice and insists I write to him. Eternel au fond de mon regard, sera votre premier sourire.. In a nutshell: an overlong tale about getting swept up by a hustler and two Belgians, who believe he is a government official. I go to great lengths to get away from them, and once I shake them off, the hustler gangs up on me with two of his mates and a barman at a café. I later realise they were all in cahoots and have overcharged me by about 5000 CFA. When my change comes, the first hustler snatches up about 1000 CFA for his friend. I have to put up a huge fight to wrench it from his grasp – and they insist the money is nothing for me. I tick them both off, threaten to call the police, make them thank me for the beers and storm off. I am furious – but realise I have only been ripped off by about $12.50, a small price to pay. Never again! So here I am stumbling abstractedly around Dakar, mopping my forehead frequently, thinking Africa is definitely the hottest place I have ever been, indeed everyone assured me Dakar was ‘very hot!’ When in fact I have MALARIA, though thankfully of the mild and non-life threatening sort. I have probably been in a malarious region for about 10 days. I paid a visit to ‘Louis Le Blanc, MD’, a doctor recommended by the medical association for travellers, but got ‘Pierre Santos, Medicales Aeronautiques’, whose grip on the English language was not strong. He didn’t tell me to apply tincture of lizards tongues or advise me to ‘put the knife under the bed to cut the pain in two’, so I am a little soothed. Today I am heading down to the Petite Cote for a few weeks before boarding the train to Mali, to find some places where people don’t constantly try to sell you undies and sunnies in the main street. 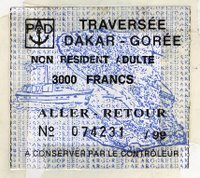 Dakar swarms with arrogant French folk on mopeds, not exactly the chatty type. One guy I saw was smoking a Churchill cigar, talking on his mobile and negotiating traffic at top speed!! 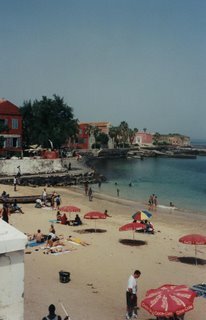 I had a marvellous day on Monday, when I visited the Isle de Goree, just off the coast. It is a tiny world heritage site billed as a popular slave trading post from last century, although this is stretching the truth a bit, apparently. I took a stroll up to ‘Le Castel’ the topmost part, with some ragged-looking WWI and WWII cannons, fortifications, and a great view. 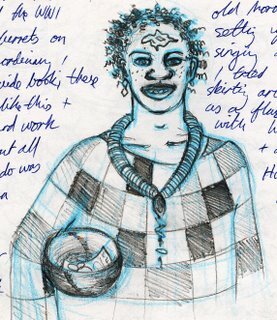 I was amazed to find people living up there tucked away in the tunnels and turrets, the ‘Baye Fall’ disciples. This is a bizarre breakaway Islamic sect, who are apparently nuts about hard work rather than prayer and charity. From what I could see, they spend all day drinking tea, smoking dope and playing drums for money. One guy I chatted to was most keen I join them! The Baye Fall disciples all have patchwork robes, big shell or leather necklaces, dredlocks and blue tattoos on their foreheads. Very weird! Je suis le responsible du Cyber, je t’ai identifie, et je vois que tu es une tres belle fille, et je t’estime beaucoup, car tu as ete tres correecte, tres serieuse. J’aimerais nouer des relations amicales avec toi. Dans l’attente plaisir de te lire bientot, veuillez croire a mes sentiments devoues. He thinks I am beautiful! He has seen me a lot! He has noted I am correct and serious! He wants to have amicable relations with me! Er… who is he again???!!! Hurrah! The font is bigger!